Roundtable Methodology and Standardization in an Experiential Learning Curriculum Andrew N. Schmelz, PharmD and Jasmine D. Gonzalvo, PharmD, BCPS Purdue. 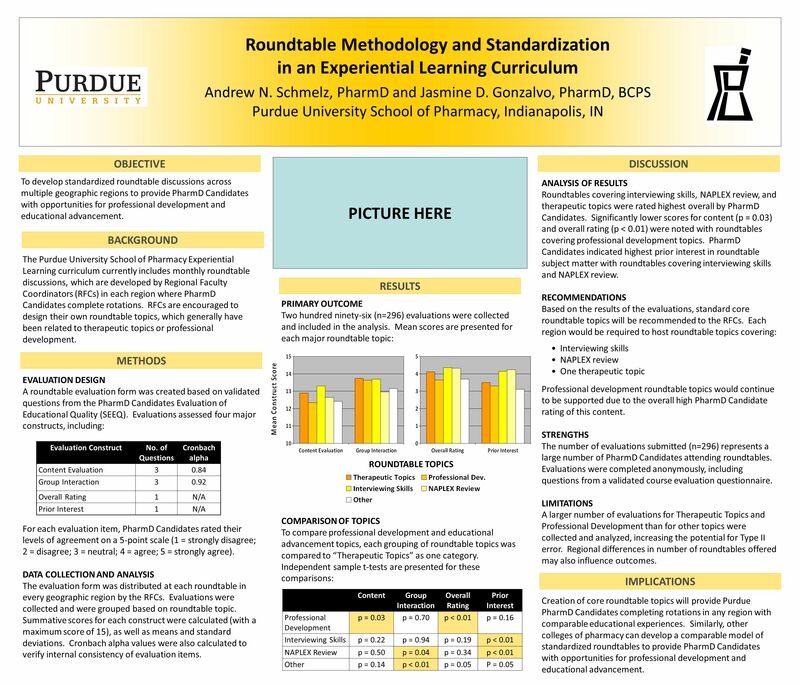 Download ppt "Roundtable Methodology and Standardization in an Experiential Learning Curriculum Andrew N. Schmelz, PharmD and Jasmine D. Gonzalvo, PharmD, BCPS Purdue." 1 In Search of Closing the Continuous Improvement Loop: Outcomes Assessment of Student Knowledge M. Suzanne Clinton Associate Dean, School of Business. There is no program and no policy that can substitute for a parent who is involved in their childs education from day one. President Barack Obama Overview. Psychology Practical (Year 2) PS2001 Correlation and other topics. Principles of Measurement Lunch & Learn Oct 16, 2013 J Tobon & M Boyle. SLS 1503 Information Literacy Assessment Study ILIS Presentation. 05/19/04 1 A Lessons Learned Process Celebrate the Successes Learn From the Woes Natalie Scott, PMP Sr. Project Manager. Sub-heading ADMINISTRATOR EVALUATION AND SUPPORT SYSTEM Curriculum, Instruction and Assessment Leader Proposed Adaptations. 1 A Systematic Review of Cross- vs. Within-Company Cost Estimation Studies Barbara Kitchenham Emilia Mendes Guilherme Travassos. D I S C O V E R A G R O U P O F C O L L E G E S T H A T H A S F A I T H I N Y O U R F U T U R E Comparative Alumni Research Comparison of 1990s Graduates. Introductory Statistics Textbooks: The Core Concepts Plus Approach D1: Tighten the connection between lower- and upper-level courses. D2: Preserve professor-specific. Reliability and Validity checks S-005. Checking on reliability of the data we collect  Compare over time (test-retest)  Item analysis  Internal consistency. Education Studies Degrees and Employability A HEFCE / ESCalate project by Julie Anderson & Helena Mitchell. University of Arkansas Faculty Senate Task Force on Grades Preliminary Report April 19, 2005.